Urban Decay are going to be releasing these two 12 colour lipstick palettes before Christmas, holiday palettes are my favourite. All you beauty addicts know that not too long ago UD released 100 Vice Lipsticks and it is exciting that they have made a palette for one of their more recent launches. Lipstick palettes are becoming slightly more popular now, I know L'Oreal have done a few and I think it is a fantastic idea. All your lipsticks in one place, making it easier to mix and travel, for all lipstick lovers I think at least one of these palettes would be a necessity. I am not a lipstick obsessed human but hell even I am seriously tempted. They are so pretty. Most of the photos in this post are from the video xpsarkage loaded, edited by me. I love her channel, she used to do some really creative thematic makeup looks, I loved her Disney and Hunger Game series but now she mostly sticks to reviews. You can watch the video at the end of this post. I love so many of the colours in the Blackmail palette, especially 1993 and the darker colours are particularly striking, such as, Amulet and Blackmail. Gorgeous colours. 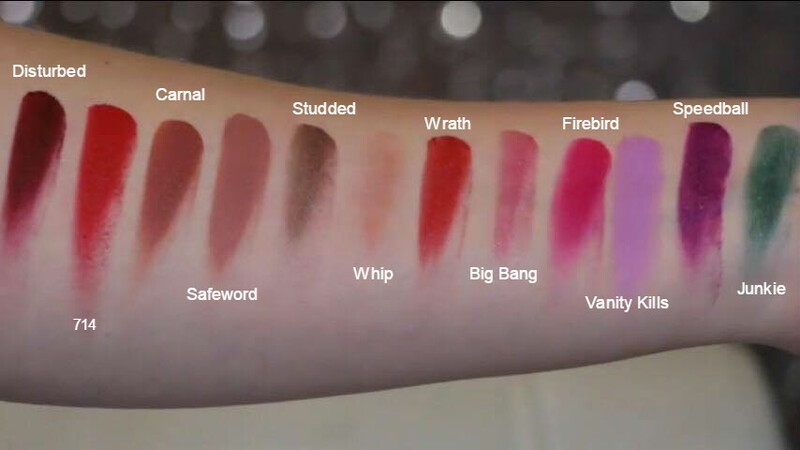 The shades are not exclusive to each palette as you can see below, with the swatches from the Junkie palette there is quite a bit of crossover. 714, Firebird and Big Bang are in both the Blackmail and the Junkie palette. In the Junkie Palette the standout colours to me are Disturbed, Safeword, Speedball and Junkie. 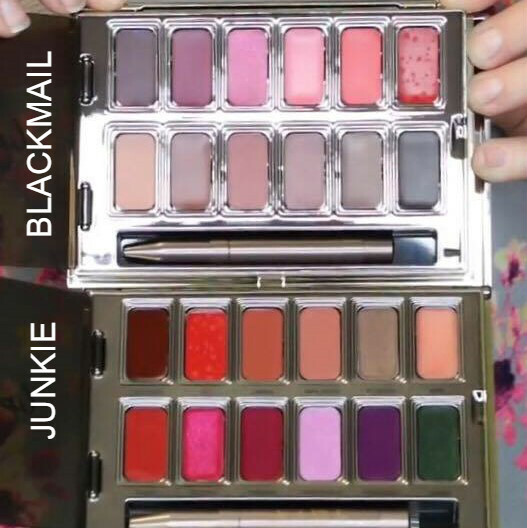 If I I had to pick one I would go for the Blackmail palette for the sole reason it contains 1993 which is my favourite lip colour in the history of all lip colours. Perfection. 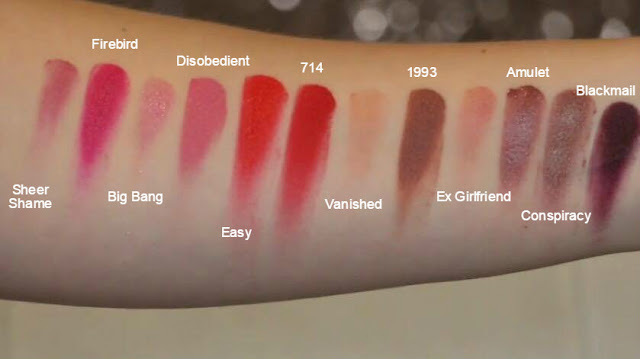 Junkie Vice Lipstick Palette swatches. Photo taken from xsparkage video (at end of post) and edited by me. Thank you so much for reading. 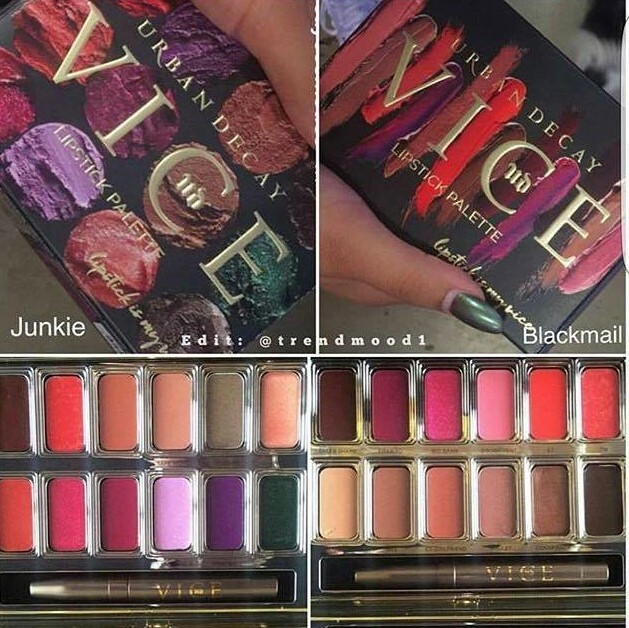 I hope you enjoyed this post and would love to know what you think of the Vice Lipstick palettes. Do you prefer Blackmail or Junkie? 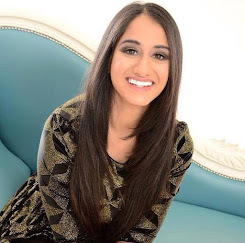 Let me know in the comments, are you excited for Christmas yet? I feel like I have been excited since July, honestly when my iPhone hits an Ariana Grande Christmas Song when its on shuffle I have to suppress my glee that we are one day closer to the holidays. I'm such a child. Hope you enjoyed your weekend. Take care. Are you digging Blackmail or Junkie or neither? 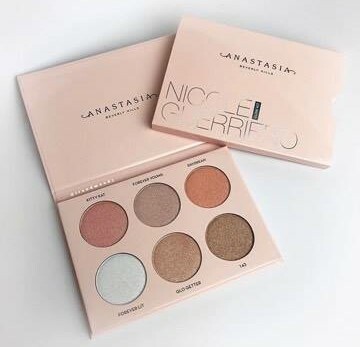 I saw one of these on a blogger's instagram and she mentioned the palettes are quite affordable. I like the shade disobedient so kuch here. I've always liked the idea of lipstick palettes especially for travel! I'm so excited by this idea. I love the fact that this is becoming a thing now, lipsticks alone can be so expensive and I feel like i rarely ever go through a full lipstick. These palettes are a dream! I have two of the L'Oreal lip palettes but I have yet to try them as I personally am not a fan of applying lipsticks with only my lip brush. 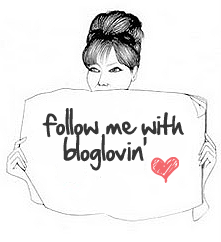 Or at least I think so...maybe I should give it a try and might just surprise myself, eh?